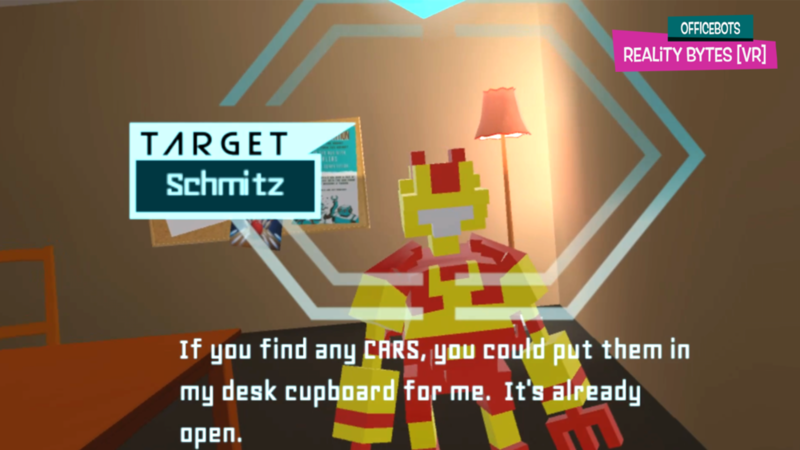 OfficeBots: Reality Bytes is a little game with a big heart. Explore a wonderfully weird corporate office, listen to your robotic co-workers’ stories, and help to solve their problems. Ultimately your goal is to find a way to escape, but your journey to freedom will give you many opportunities to brighten up the lives of others. June 6th 2018 - Melbourne, Australia — Pranee McKinlay, the founder of independent game studio FutureStateMachine, is very pleased to announce the fully-featured launch of her innovative virtual reality game OfficeBots: Reality Bytes. Originally created as a smaller solo project, OfficeBots: Reality Bytes was released on Steam for HTC Vive users in late August 2017. A tale of hope and friendship, it was told from the point of view of a robot trying to escape the grind of a dead-end office job. 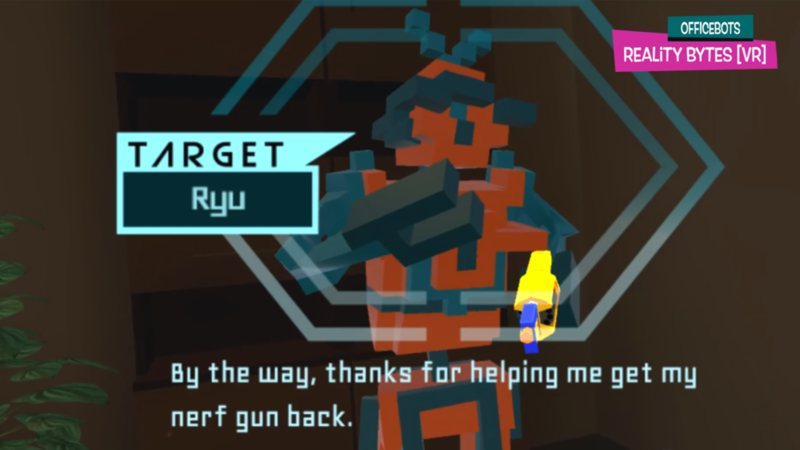 OfficeBots: Reality Bytes was created initially as a compact, experimental game that focused on encouraging player empathy through characters and immersive VR storytelling. While it was a fully playable game, McKinlay lacked the resources at that time to include all of the features and content that she had originally envisioned when beginning the project. Thanks to Film Victoria funding announced in December last year, McKinlay was able to recruit a small team to expand the game, improve the player experience, and support more VR headsets. Today, the great work of that team has been unveiled. An overhauled dialogue system that adds to the richness of this virtual world. New activities to engage in and objects to investigate and collect. A greatly improved interface to make interacting with the world easier. Robot hands for the player so they can properly get in character. Many other improvements, including Steam achievements, an enhanced world, improved player controls, and more. This update is free for all existing owners of Officebots: Reality Bytes. First-time players can on-board by purchasing the expanded Quantum edition, either on Steam today or when comes to Viveport in two weeks. With this new update, it officially supports both the HTC Vive and the Oculus Rift. A byte-sized VR adventure that can either be completed in one sitting or explored at length. Optional quests and multiple solutions give you different paths to freedom. Explore a charmingly odd virtual office and discover everybody’s hidden secrets..
Colourfully chunky robotic visuals paired with an emotionally resonant story. A big collection of Steam achievements to reward exploration and experimentation. VR exclusive title for HTC Vive and Oculus Rift designed to minimise motion sickness. If all else fails, you can find some catharsis in just trashing the place. Pranee McKinlay is an independent game developer passionate about creating meaningful interactive experiences in games, VR, film, and multimedia. As the founder, creative lead, and main developer of FutureStateMachine, a games and interactive media studio based in Melbourne, she strives to improve the world through play. She's been playing video games since the birth Space Invaders on the ATARI console. When she was young, she owned a Commodore 64 and wanted to be a computer programmer. She discovered that her talents lay more in game and narrative design, art direction and creation, UI / UX design, and working as a producer. However, she still programs whenever she needs to, as was the case with OfficeBots: Reality Bytes [VR]. Having worked in the Film Industry for over 10 years on several highly regarded films including Avatar, The Chronicles of Narnia, and The Lord of the Rings, Pranee McKinlay now makes quirky, story driven games with a whole lot of heart and soul. Q: WHAT WAS THE INSPIRATION BEHIND OFFICEBOTSVR? A: I was working part-time as a Games Master in an Escape Room to fund my indie game development and help pay the bills. Working there made me reflect upon how people often end up working, sometimes for years, in jobs that they never intended doing. In jobs that perhaps make them miserable, often because of circumstance or timing. I thought about how people often have dreams, desires and life goals which often get side-tracked because “life” gets in the way. People are often faced with hurdles which set them back from achieving their long term goals. They may come from a poor family who can’t afford to support their further education. They may face homelessness at an early age. Someone close to them may become sick and they need to take time out to care for them. Maybe they suffer from depression which makes everything hard. Maybe they became a single parent at a young age and are faced with the responsibility of looking after another. It could also be a result of external societal factors such as racism, economic systems, sexism, or homophobia. All these barriers make it harder for people to achieve their desired dreams. I feel that western cultures in particular often focus upon a person’s identity and worth being greatly determined by their career success or failures. I wanted to inspire others to reconsider what they were doing so that they would be encouraged to take a risk and follow their dreams. I wanted to experiment with conveying all these thoughts I was having by creating an experience which resonated with some people, and encouraged reflection, cognitive empathy, and compassion for others. As a person of colour with a complicated back story, I know from personal experience how hard things can sometimes be. I wanted to give people a gentle nudge in a setting that was sympathetic rather than being judgemental or prescriptive. I’m not sure if I succeeded but it was an interesting experiment nonetheless. It’s a difficult challenge, especially as a solo developer with minimal resources. I’m so thankful that Film Victoria has given me the financial support and encouragement to help me improve the project so that it can potentially reach a wider audience. A: I’m a self-confessed tech geek. I love exploring new and interesting technology. I had access to a HTC Vive Developer Kit and wanted to create a project which was specifically designed for virtual reality instead of trying to “shoehorn” a game into VR. I wanted to create an experience which encourages cognitive empathy from the player by immersing them into a story-rich world. VR is an incredibly powerful medium for sharing experiences and I wanted to create ones that made the player feel a wider spectrum of emotions. VR headsets have been dubbed an “empathy machine” due to the highly immersive nature of the experience they can provide. The ability to deeply affect a player through creating worlds and storytelling was enticing to me. I feel that our modern world lacks empathy and understanding and wanted to focus upon the hurdles that some people face in their life which may make it harder for them to achieve the dreams and goals that they really desire. I hope YOU LOVE The EXPERIENCE WE'VE CREATED TO SHARE WITH YOU! Please get in touch if you have any questions or want to know more about this quirky virtual reality project.